Whenever I find a software testing position in a field in which I am unfamiliar, I try rounding up all resources I can. In my security testing research, I found a syllabus for Tufts University's COMP 116: Introduction to Computer Security course offered Spring of 2018. Just my luck! The instructor for the course posted the entire syllabus and required reading material online, including a copy of a wonderful slide deck for a presentation on an Introduction to CVE, CWE, and the Top 25 given by Steve Christey Coley, creator of the term, CVE -- Common Vulnerabilities and Exposures. According to CVE.MITRE.org, in their terminology section, "a vulnerability is a weakness in the computational logic (e.g., code) found in software and some hardware components (e.g., firmware) that, when exploited, results in a negative impact to confidentiality, integrity, OR availability. Mitigation of the vulnerabilities in this context typically involves coding changes, but could also include specification changes or even specification deprecations (e.g., removal of affected protocols or functionality in their entirety). "smurf (denial of service by flooding a network)"
MITRE, a not-for-profit in Bedford, MA, maintains the Common Vulnerabilities and Exposures (CVE)® List. By the way? MITRE is not an acronym. James McCormack, who helped draft the charter wanted "a name that was meaningless and without connotations, but with an attractive feel", according to MITRE's Media Resources section. "Some thought the word MITRE was based on the word for joining or fitting together. Others believed the name came from combining industry names and keywords. McCormack, however denied all these explanations". MITRE operates federally funded research and development centers for the federal United States government. Where Did The CVE List Originate? 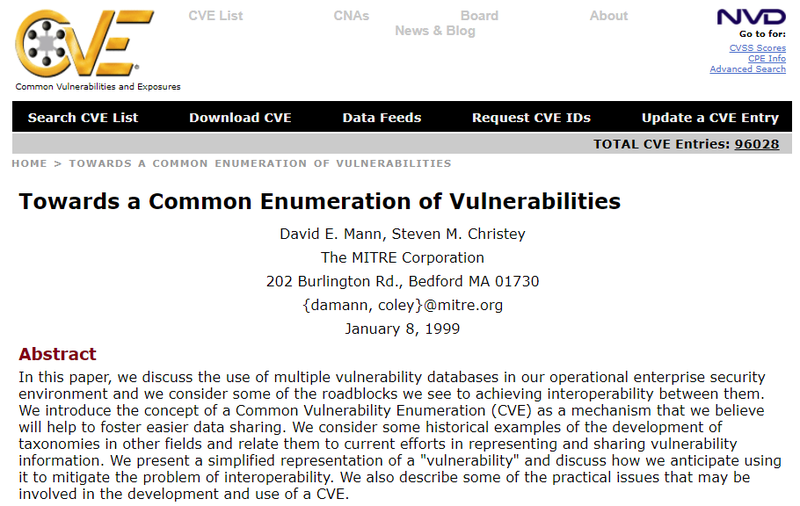 David E. Mann and Steven M. Christey published a paper back in Jan. 1999, Towards a Common Enumeration of Vulnerabilities, which can be accessed on MITRE's website in HTML format. Originally, CVE stood for "Common Vulnerability Enumeration", but was renamed Common Vulnerabilities and Exposures. It was hard to check to see if you had three different vulnerabilities or just the same vuln in different forms. According to a later paper, The Development of a Common Enumeration of Vulnerabilities and Exposures, published in September 1999, "CVE development was broadened by creating a CVE Editorial Board, which includes information security community representatives from tool vendors, research and educational organizations, MITRE, and others. The CVE Editorial Board is currently enumerating a large number of vulnerabilities, while simultaneously attempting to capture and codify the decision-making process. When a significant number of vulnerabilities are validated and verified, an initial version of CVE will be released to the public". ... By then, CVE was renamed "Common Enumeration of Vulnerabilities and Exposures". Why a CVE List? Wouldn't It Be a Resource For Hackers? According to The Development of a Common Enumeration of Vulnerabilities and Exposures, the rewards for listing publicly known security vulnerabilities outweighs the risks. "CVE is restricted to publicly known vulnerabilities. "Sharing information is more difficult within the information security community than it is for hackers (e.g., commercially funded databases have copyright issues precluding their use). "It takes much more work for an organization to protect its networks and eliminate all possible security holes than for a hacker to find a single vulnerability, exploit it, and compromise the network. "Community opinion is shifting towards sharing information, as reflected in the fact that the CVE Editorial Board includes key organizations in the community. "A widely accepted common enumeration would enhance tool interoperability, enable effective communication, and create a more cohesive security posture, thus reducing the overall risk of compromise". What is the CVE List? "The CVE List is built by CVE Numbering Authorities (CNAs). Every CVE Entry added to the list is assigned by a CNA. "The CVE List feeds the U.S. National Vulnerability Database (NVD) — learn more". Use very specific keywords, such as Sendmail, wu-ftp and other application names, not general ones such as "Unix" or by operating system since the results will be incomplete. How is a CVE Added To The CVE List? There are many CNA participants, such as Adobe, Airbus, Alibaba, Android, Apache, Apple, etc. What is a CVE ID? "A CVE ID is the number portion of a CVE Entry, for example, 'CVE-1999-0067', 'CVE-2014-12345', and 'CVE-2016-7654321'. "CVE IDs are used by cybersecurity product/service vendors and researchers as a standard method for identifying vulnerabilities and for cross-linking with other repositories that also use CVE IDs. "[...] CVE ID syntax defines the ID number component of a CVE Entry, for example, "CVE-2014-9999999", which includes the CVE prefix + year + sequence number digits. "With the new syntax, CVE IDs can now have 4 or more digits in the sequence number portion of the ID. For example, CVE-YYYY-NNNN with 4 digits in the sequence number, CVE-YYYY-NNNNN with 5 digits in the sequence number, CVE-YYYY-NNNNNNN with 7 digits in the sequence number, and so on". CVEs can be Reserved, Disputed, or Rejected. Note, there isn't any information listed in the CVE List on how to fix the problem. That is the purpose of the U.S. National Vulnerability Database, which also supplies vulnerability metrics and severity scores, also known as CVSS. For an example of how the CVE is listed, take a look at the list on Twitter of @CVEnew, a Twitter feed of newly reported entries. Description: "The Grammarly extension before 2018-02-02 for Chrome allows remote attackers to discover authentication tokens via an 'action: "user"' request to iframe.gr_-ifr, because the exposure of these tokens is not restricted to any specific web site". "About CVE Entries - a high-level overview of CVE Entries including creation, states, and more. "CVE Entry Basics - answers to basic frequently asked questions about CVE Entries. "CVE List Basics - answers to basic frequently asked questions about the CVE List. "Using the CVE List - answers to frequently asked questions about using the CVE List. "CVE List Search Tips - tips for searching or viewing the CVE List. "Updating Information in CVE Entries - instructions for how to request updates to entries on the CVE List". What is NVD, the National Vulnerability Database? According to NVD.Nist.Gov, "The NVD is the U.S. government repository of standards based vulnerability management data represented using the Security Content Automation Protocol (SCAP). This data enables automation of vulnerability management, security measurement, and compliance. The NVD includes databases of security checklist references, security-related software flaws, misconfigurations, product names, and impact metrics. "[...] The NVD is the CVE dictionary augmented with additional analysis, a database, and a fine-grained search engine. The NVD is a superset of CVE. 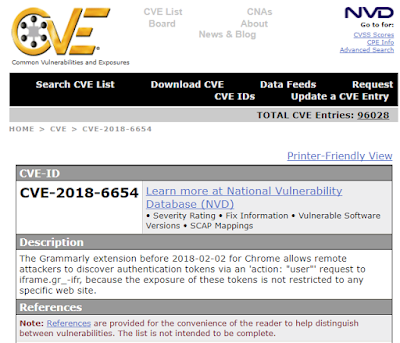 The NVD is synchronized with CVE such that any updates to CVE appear immediately on the NVD. How does the NVD assign vulnerability severity scores? The NVD uses the Common Vulnerability Scoring System (CVSS) Version 2, which is is an open standard for assigning vulnerability impacts that is used by a variety of organizations. NISTIR 7946 - CVSS Implementation Guidance describes methodologies developed by the NVD for using CVSS, and along with Appendix B describes the NVD’s entire vulnerability assessment process. How should I use the CVSS scores provided by the NVD? "The NVD analysis process provides a Base metric vector and associated score as calculated using the CVSS Base Equation. Organizations can use this information, along with additional Temporal and Environmental vectors and scores, to determine an overall score. This score can then be used to assist in ranking the severity of vulnerabilities associated with the organization’s computer network, which can help determine mitigation strategies. For more information on CVSS metrics, vectors, and scores, please refer to the CVSSv2 Complete Documentation". How can my organization use the NVD data within our own products and services? "All NVD data is freely available from our XML Data Feeds. There are no fees, licensing restrictions, or even a requirement to register. All NIST publications are available in the public domain according to Title 17 of the United States Code. Acknowledgment of the NVD when using our information is appreciated. In addition, please email nvd@nist.gov to let us know how the information is being used. How often is the NVD updated? "The NVD is updated whenever a new vulnerability is added to the CVE dictionary of vulnerabilities. The vulnerabilities are then analyzed by NVD analysts and augmented with vulnerability attributes (e.g. vulnerable versions) within two-business days excluding Federal Holidays". How is the CVSS Scored? "CVSS is owned and managed by FIRST.Org, Inc. (FIRST), a US-based non-profit organization, whose mission is to help computer security incident response teams across the world. FIRST reserves the right to update CVSS and this document periodically at its sole discretion. While FIRST owns all right and interest in CVSS, it licenses it to the public freely for use". - Common Vulnerability Scoring System v3.0:Specification Document. "The Common Vulnerability Scoring System (CVSS) is an open framework for communicating the characteristics and severity of software vulnerabilities. CVSS consists of three metric groups: Base, Temporal, and Environmental. The Base group represents the intrinsic qualities of a vulnerability, the Temporal group reflects the characteristics of a vulnerability that change over time, and the Environmental group represents the characteristics of a vulnerability that are unique to a user's environment. The Base metrics produce a score ranging from 0 to 10, which can then be modified by scoring the Temporal and Environmental metrics. A CVSS score is also represented as a vector string, a compressed textual representation of the values used to derive the score".